We brainstormed different ideas and the children decided to make a beautiful drawing for them; many wrote “Los queremos mucho” or “Que la pasen bien”. 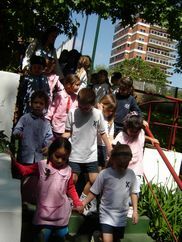 As soon as the children from the Jardincito arrived, they went to see our Art exhibition in the K3 Multipurpose Hall, where their work was also hanging from walls or on tables. After going around, proud and happy to see their artwork, looking at our paintings, mandalas and work done with junk material, they went to K5 classrooms to spend some time with our children before break and lunch time. Some children went to the Whales classroom, others to Tigers and the rest to Pandas. Our children made room for them, therefore they were all mixed up. They told us their names and exchanged a few ideas. When it was break time Whales looked for their new friend, held their hand and went towards the playground, Tigers and Pandas also invited their special guests to join their games. It was so nice and enriching; they were all playing together as if they had known each other for some time. All the preschoolers were incredible hosts, playing with them at all times and making them feel at home. At lunch-time we all shared some empanadas and ice-cream in the playground, sitting them in such a way that again they were all mixed up. They chatted, laughed and enjoyed this very special day together. After lunch, they watched a DVD as the sun was too strong and the weather too hot. Then the time came to say good-bye. Before they left they went back to the different classrooms to wrap up the visit. They were all extremely happy because they made new friends and had a lovely day at the Kindergarten. Congratulations to all the Pandas, Tigers and Whales! Your good behaviour and caring attitude were praiseworthy!